Apollonia Music unveils its latest release, which comes straight out of Dan Ghenacia’s lab. The fresh new EP is amusingly titled ‘The Egg’ after his son, who was born just a few months ago, and sees Dan bringing together three productions with different styles and flavours, each with an egg-related track name. It’s been a while since monsieur Ghenacia appeared on Apollonia’s label, but this EP is definitely worth the wait… On side A it’s ‘O¨ La Coque’ (Boiled Egg), aptly-titled with its aquatic low end percolating and bubbling away. Quirky effects keep things interesting throughout, adding depth and movement… then we get a killer riff which lifts the vibes higher. Once that disappears a mysterious set of chimes arises from the deep adding a mystical feel to the track before it continues on with its bubbly groove. Flip the record over and side B kicks off with ‘Mykonos Huevos’, which boasts hard-hitting percussion and a sublime b-line designed to get those hips moving with a sensual rhythm. The insistent, dramatic atmosphere is relentless and this is one of those cuts that will captivate the dance floor when it’s dropped. Lastly, we have ‘Sunny Side Up’ which rounds off the EP nicely, bringing that Sunday after hours vibe you’ll find at Dan’s party GoDEEP. This one has a heady vibe with a hypnotic main riff and secondary piano riff that complements it perfectly. The beats are crisp, the low end warm and soothing which, combined with progressively trippy atmospherics, envelopes you and transports you to a better place, way beyond the stars. 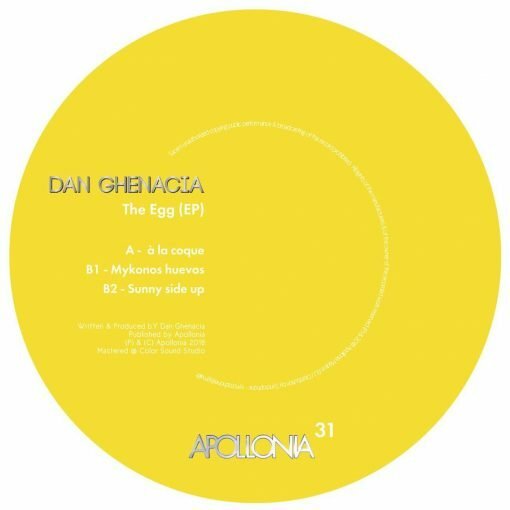 … And there it is, a thoroughly eggscelent EP from Dan Ghenacia, courtesy of Apollonia Music. More items from " Apollonia "
More items from " Dan Ghenacia "